Frosted or Clear Plastic give a truly unique look! 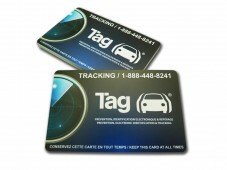 Custom Plastic Cards display bold and vibrant colors extremely well. These are commercial quality cards and are used for Loyalty Cards, Gift Cards, Membership Cards, Plastic business cards, hotel key cards and many other uses. In standard credit card size and available in different thicknesses. Our pvc plastic card stocks range from a thin, flexible 12 mil (.03mm) plastic card stock to a sturdy 30mil (.76mm) which is the standard credit card thickness. These custom printed cards are available with any option that you could need; barcoding, magnetic stripes, embossing and raised numbering tipped in silver or gold. Also available from Montreal Printing are signature panels, scratch-off numbering and you can even add foil stamping from a wide range of metal foils. What are the special options on our plastic cards? Foil Stamping: This is a metallic leaf that gets applied from a custom-made die of whatever it is you need foiled. The die is then heated up and compresses the foil to the pvc card. Traditionally foil stamping is usually used on logos giving them a highly reflective metallic effect. Recently however designers are pushing the boundaries and using these foil colors in their creative patterns. The most common colors of foil are silver and gold, but they do also come in copper, dark blue, teal, red, pink, green purple and black. Signature Panel: This is used when a signature on the card is required or if you need to hand write a code or a date on the card. Scratch off numbering: This is fun way to reveal discounts as it gets the client involved, the excitement for the client is a very similar feeling that you get when scratching a lottery ticket. The size of the scratch off area is 6mm x 20mm. How to know which magstripe you need? There are two different types of magstripes Track 1 & Track 2. To know which one is best suited for your P.O.S (Point of Sale) machine, check your manual’s technical specifications or look online for your make and model. Alternatively you call the company that you bought the equipment from. Track 1 & track 2 can also come in HiCo (High Coercivity) or LoCo (Low Coercivity) On our site we only offer HiCo as it is simply a longer lasting and more secure encoding. If you do want LoCo anyway then you can simply mention this in the “notes” section, located at the end of the order process. HiCo is encoded at 2750 Oersted which is far more resistant against outside magnetic fields that could erase encoded data. LoCo: This is generally used when data is not needed to be stored on cards for long periods of time, encoded at 300 Oersted. Examples would be theme parks, hotel room keys, ski hills or amusement parks. Barcoding: There are many kinds of barcodes to choose from and it is best for you to see which types your P.O.S machine can accept. Bar coding works great with promotional cards or gift cards, a plastic card designed properly will also work great as a discount card. This information is available in your P.O.S manual or online. Barcode letters and numbers can also be printed under the barcode in case your POS machine ever goes down or if you need to visually see the digits. Keep in mind the longer the numbers/letters the larger size the code will be. Embossed numbering: Just like the numbers on bank cards or credit cards, they are raised from the surface of the card and can be gold or silver tipped. The embossing can be both numbers or letters, these can also be used for phone numbers. One thing to keep in mind is that these numbers are embossed on the front of the card but debossed on back of cards, so make sure there is no important text of graphics on the back of the card, that will get affected. We are also able to print the numbering without the embossing if desired. 30 mil or 12 mil Thickness: The most common thickness of a pvc plastic card is 30mil which is the same thickness as your bank card or credit card. 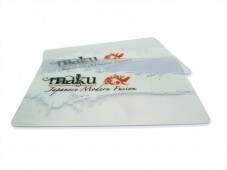 We also offer a thinner more flexible card which is 12mil. The advantages of 12 mil cards is that it takes up less room in someone’s wallet or purse.The advantage of 30 mil is it is more solid and mimics the feeling and look of banking cards. Re-printable Surface: This option is for when you need to print information on the pre-printed cards at a later date, like names for photo ID badges or dates for specific events on your id card printer. The reason why it is recommended to choose this finish if you are sur-printing over the pvc cards is to make sure that the heat from your thermal printer does not burn the existing pre-printed graphics. Companies often use Montreal Printing as their plastic cards manufacturer to print the backgrounds of their plastic cards as it is much more affordable and the quality is top notch.